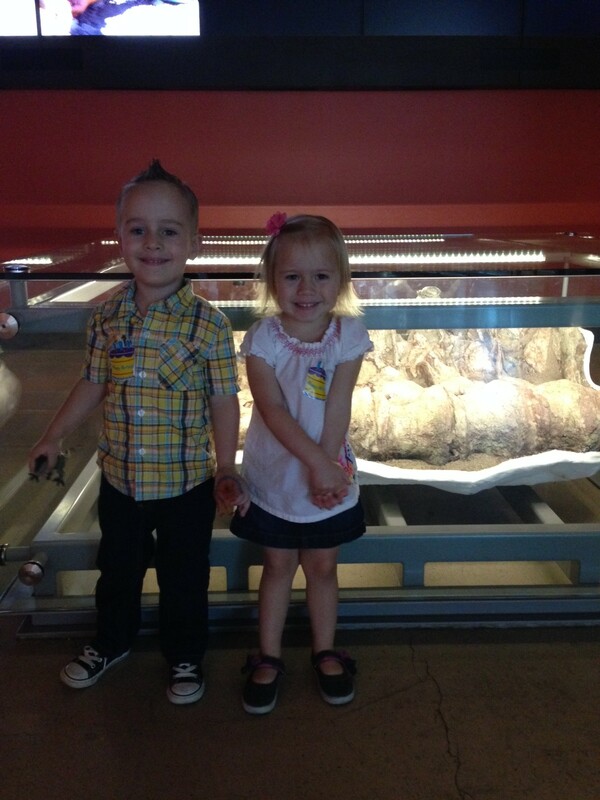 Ellie and Gray spreading love at the Natural History Museum of L.A.
Every night as they’re tucked in to bed, Gray and Ellie ask where they’re going the next day. It’s become a routine. Target? Aunt Karis’s house? Anywhere? 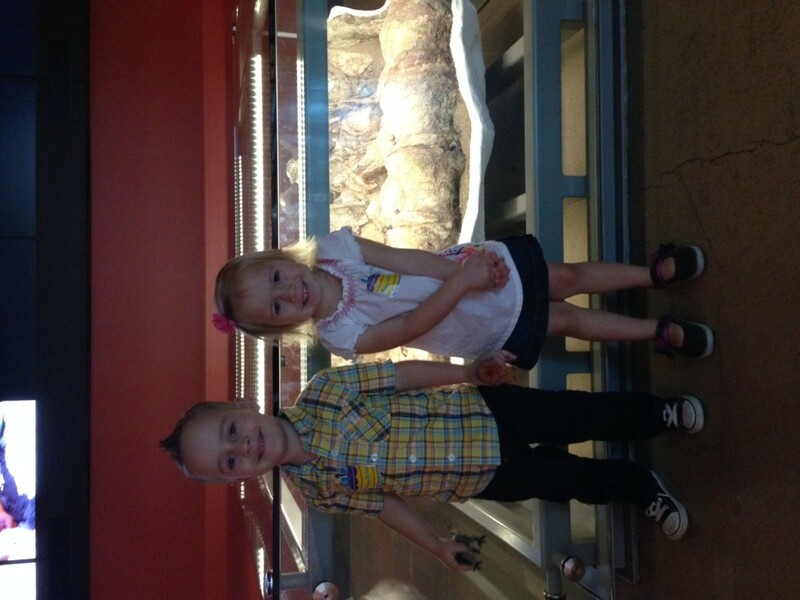 So they woke up on January 29, Jax’s sixth birthday, knowing we were going to the museum to see dinosaur bones. My wife made cupcakes the night before. Like last year, she planned on delivering them to Jax’s preschool teacher, so they can have a little party for Jax. I didn’t go last year. I couldn’t deal with it. This year, though, I was going. 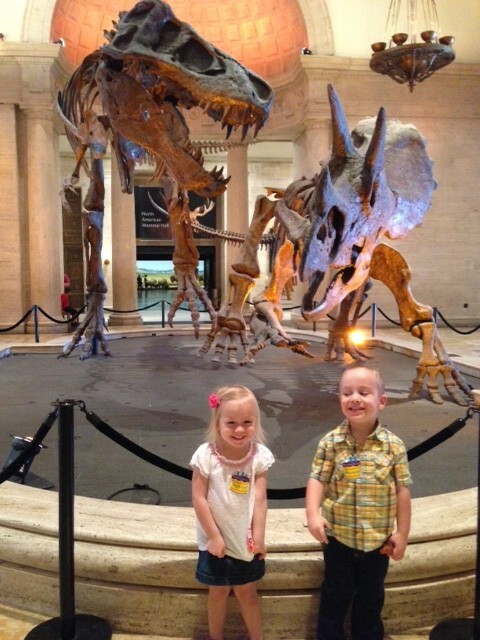 So when the twins’ heads hit their pillow, they knew the next day we were going to Jax’s school and to the museum. On the morning of the 29th, Gray confirmed our plans with me from his crib. “Jax will be at his school for his party,?” he asked innocently. “No, buddy,” I replied, with what’s left of my heart breaking into more pieces. “Jax is in heaven, remember?” Gray wants to see his big brother again so badly. He thought he’d see him on Christmas Eve at my parents. He was convinced. And now, I mean how could Jax NOT be here for his birthday? “Okay, so after his school we’ll go to heaven?,” Gray asked. I wish, I thought to myself. I wish. The kids grubbed on breakfast, my wife packed up and in a feat in and of itself, we were out of the house on time. It rarely happens. On our way to the preschool, which I haven’t visited in 18 months. It was a good start to a long day. We passed a fire truck that parked in front of a residence on our route to the preschool. I nudged my wife. We both knew. He was with us. We entered the preschool and were welcomed by the school’s director. She hugged us and said that they received a donation earlier that day for Jaxson’s scholarship, which they started to aid families with the cost of attending the preschool. In fact they were able to offer four families assistance in December, she informed us. I started to cry. I was a mess. My wife teared up. We went upstairs to Jax’s old class and visited with his teacher. She was wearing the same shirt she wore on the last day of school in June of 2012. The last day she saw him. My tears wouldn’t stop. She visited with us for about 10 minutes as her class patiently waited on the carpet in a circle as the confetti cupcakes topped with a green jack (like the game, jacks) teased their taste buds. It was so good to see her. She was so good to Jax and loved him so much. A photo of Jax and my wife was posted above her desk and a rectangular wooden sign with his name and 6-24-12 hung on the wall. Gray and Ellie didn’t want to leave. They were all set to hang out the rest of the day. We don’t have to worry about them crying on their first day of school in August. This was a perfect way to start the day. The amount of love everyone at that school has for Jax and our family is astounding. I walked back out to our minivan with a little more peace. It made facing the day a little easier. And I’m grateful for that. The night before I tried to get Gray pumped about dinosaurs. We got him some plastic ones for Christmas, so he and I played on the floor for a bit with them. He asked all of their names, and I struggled to read the bellies of the creatures to confirm. The triceratops is his favorite. When we were done he placed it by the front door so he’d remember to bring it with him to the museum the next day. The T-Rex, Jax’s favorite, also came along. At the center of the Natural History Museum of Los Angeles, once you’ve entered, is a display of a tyrannosaurus rex and a triceratops. Orange lights illuminated the brown fossils. I’ve always thought it was beautiful. But during our last two visits, my chest tightens, my belly aches and I hold my breath. Those bones, that room; they remind me of our day with Jax. Gray was interested in the fossils for about five minutes. 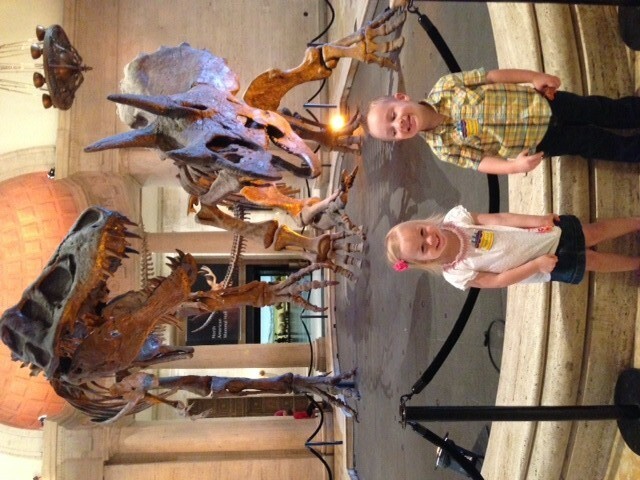 He and Ellie were more interested in exploring the halls of the museum. They asked where every door led to. For some reason, as we walked back through the fossil exhibits we already paroozed, Gray had me carry him. The bones scared him. The hell? Little man, you were fine the first time. Weirdo. I couldn’t get Jax off my mind. Where did he stand? What did he say? I wish he was standing next to me. We went upstairs and looked at the specimen that proved my “Jax is a huge dinosaur nerd” statement. I told my wife the story. In short, Jax saw the bones and named the specimen. I told him I thought it was something else (I don’t remember the name, but it started with the letter P). Both had a funky bone on the skull that looked kind of like a fin. He was convinced he was right. I was convinced I was, but I didn’t let him know that. As we walked by I read the name. Corythosaurus. He was right. Of course. Why’d I ever even doubt him? Mind blown. 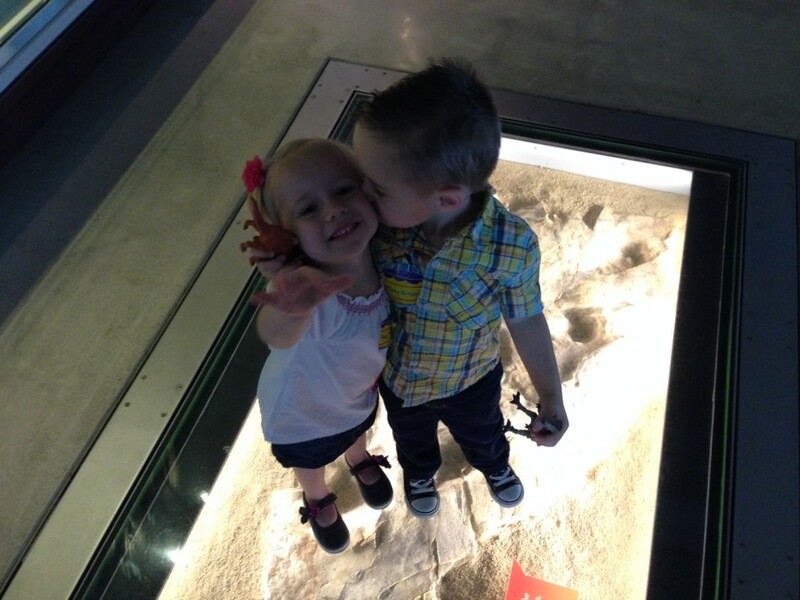 My little paleontologist. 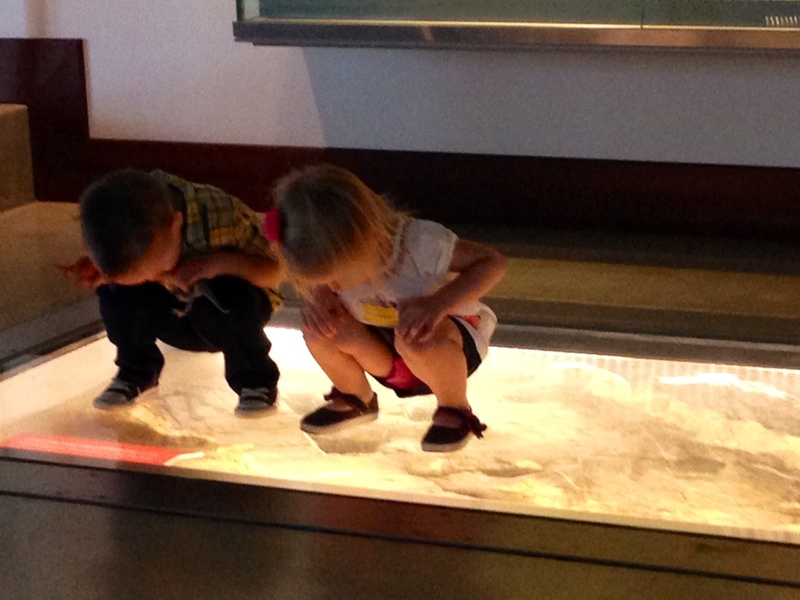 I snapped a pic of the fossils, but the glare off of the glass is pretty hideous. Here’s an illustration I stole off the ‘net. For the most part the kids were well-behaved. They got excited and would run or yell, but that was it. At one point Colin Farrell walked by, all L.A-ed out with tight jeans, white t-shirt, boots and some weird wrap thing in his hair. He told his son, this little sandy-blond kid, that he already had enough toys at home. It was definitely Colin Farrell. Have you SEEN those caterpillar eyebrows? We spent about four hours at the museum. We picked out a totally nerdy dinosaur book for Jax and let the kids get a souvenir. Gray grabbed a T-Rex stuffed animal he named Cracker. Ellie took a monkey, but she’s not original to come up with a name. At first she said Ellie, then Gray Gray, then Cracker (stealing Gray’s brilliant name). Meanwhile, I fell in love with a $500 robotic dinosaur named Pleo. After suffering through traffic in downtown L.A. we met up with our family at Red Lobster. It was comforting for me to be with everyone. It’s a safe place and we could all share our own sadness on this day together. As it should be. Not alone, separated. I downed two Maker’s Marks on the rocks and a Bud Light to help ease my anxiety and numb the pain. Gray desperately wanted to try lobster for the first time. He took bite from my fork and quickly washed it down with his water. I don’t think he even took a bite. Just swallowed it whole. We ended dinner and sang Happy Birthday to Jax with our candle-lit cupcakes that my wife made. I felt peace this year. The experience at the preschool, sharing a fun day with the twins and my wife, together, and being with family (and maybe the drinks?) made the day bearable. It’s a day Jax would’ve enjoyed. Part of me likes to think he did enjoy being with us all day. But then the angry, bitter, pessimistic part tells me not to be such a pansy. I can’t reach over and hold his hand. It’s not the same. Back at home we watched slide shows and videos of Jax as we cuddled on couches together. Then Ellie puked all over my wife. Really. She warned us when we left Red Lobster. As good as could be expected. That’s how I described the day when asked. Sadly, that’s about as good as it gets for me now, especially on holidays, a birthday or remembrance. As good as could be expected. My new, unwanted measure. 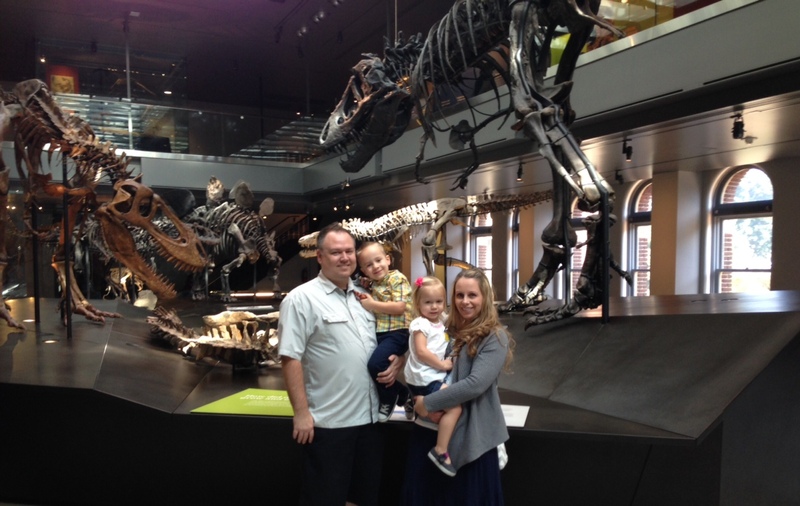 This entry was posted in Jax and tagged dinosaurs, jax, natural history museum, pleo, red lobster by Seth. Bookmark the permalink. What a sweet day. Im glad you shared. It’s nice to see his memory living on with the donations at school. Lilly asks about heaven a lot and when she can go. It’s a hard thing to explain. At least they understand it’s where love is. Thank you for sharing. I wish I could buy you and your wife a drink, and cheers to ‘as good as can be expected’. Hang in there guys. xoxo PS What is the donation for the preschool? Is that something anyone can do or is it a secret for security reasons. If you have a fundraiser for them, I would love to offer a small gift. I believe Jax was with you. I’m glad you had an alright day. Thanks for sharing. As always, I was excited to see your post. Your way of handling Jaxsons birthday was heart felt and amazing. I love that you still include him in your everyday lives. I can see where explaining things to Gray and Ellie may help you all in your healing process. Thanks for the update. He is beautiful. I so get “as good as it could be” the new measure of goodness, the whole new reality. Thank you for writing. I cried and cried as I read your words and saw beautiful pictures of your son because I KNOW. I know. The missing never lessens.